When I was staying in Bangalore with Nami, we were hooked onto the jammie cookies for a while. Though sickly sweet, it was like a treat for us. Just as well they made small packages otherwise can;t imagine how many we would have gobbled. A little bit of jam appeared on top of the sandwiched cookies. Each packet had about 6 tiny cookies. 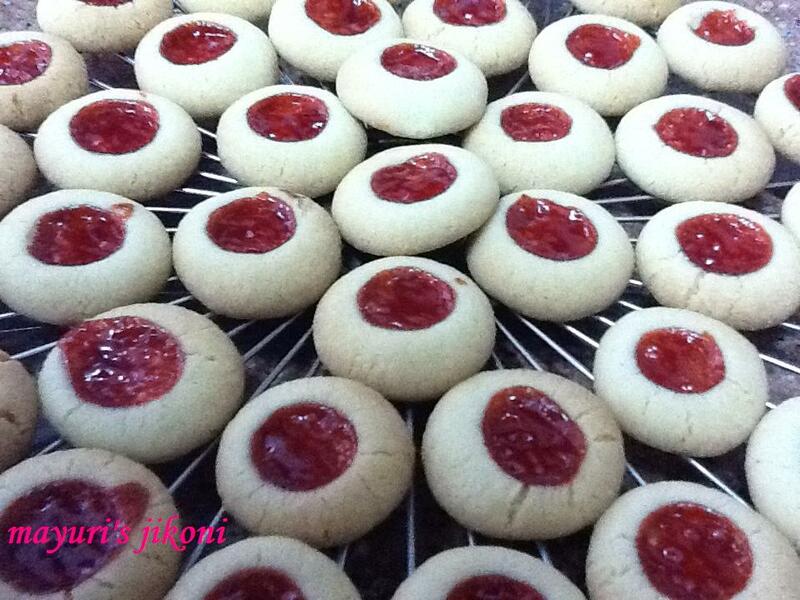 I searched the net for jam thumbprint cookies and found countless recipes. The first time I made them, the cookies became too soft. I then read through a few recipes, read the comments and combined ideas from a few and came up with this one. Slightly crunchy and a wee bit chewy at the same time, but at least they stay for a while in the cookie jar without going all soft. I didn’t like the ones where the jam was added after baking the cooking. I rolled them out pretty small, as I made them for the Annakut ceremony which took place at my aunt’s place after Diwali.They looked pretty and dainty. Annakut is usually celebrated the day after Diwali. It celebrates the victory of Lord Krishna over Indra who sent a deluge of rain. To protect the people and animals of Vrindavan, Lord Krishna lifted Govardhan hill with his little finger. Annakut means a mount of grain. To this day people make a mount of grain and prepare different variety of food to offer to Lord Krishna. Cream butter and sugar till it becomes soft, light and fluffy. Add flour and make a soft dough. At this point you may need to use your hand. Leave the dough in the fridge for 30 minutes if it is too soft. Mix jam very well till it becomes like a thick paste. Grease baking trays with butter. Take about half a tsp of the dough and roll it into a small ball. Continue till all the dough is over. Using the back of a pen, pencil or a wooden spoon handle make dents in the rolled balls. Using a piping bag or tube, fill the dent with a big dot of jam. Bake the cookies for 12 to15 minutes. Remove the tray from the oven. Leave the cookies on the tray for 5 minutes. Remove from the tray and let the cookies cool on a wire rack. Use a jam of your preference. To make medium size cookies take a tsp full of dough. Be careful not to eat the cookie as soon as it comes out of the oven as the jam will be very hot. Dip the handle or pen in some flour so that the rolled ball does not stick to it. Use a tiny spoon to fill the dents if you do not have a piping bag. thanks Beena, they were a hit at the family wedding. Cookies are tempting, good idea with jam, I will try.